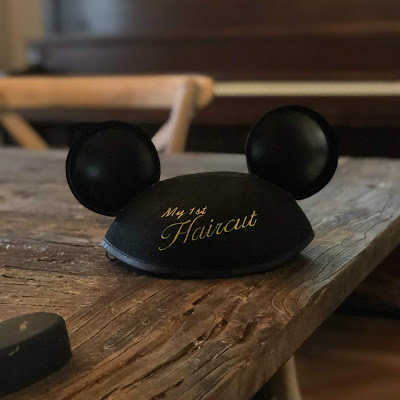 We just got back from our Spring trip to Walt Disney World (Alfie's second, for those counting...) and we're definitely still in the digestion phase of our post Disney grief. In other words, we're sifting through memories, pictures, videos, and souvenirs. Quick note: Becoming a dad has made me a VERY bad and even more lazy blogger...so while I have tons of pictures of my son galavanting around the parks, I don't have many "detail" shots that I used to prize myself on. In fact, I think I took a paltry 500 or so photos, all of which are of Alfie or drunk selfies. All of this just to say, I have no actual pictures of the barber shop. For those unfamiliar, the Harmony Barber Shop is located on the Town Square of Main Street USA, to the left as you enter the park. I had never even peeked inside prior to this visit, because its kind of tucked away and though I had a professional curiosity I just never got around to it. The space itself is way smaller than I thought it would be, three working stations VERY close to each other. ( I work in an enormous salon with 35 stylists and full spa...so yeah, different.) The barber shop maintains the turn of the century theme of Main Street, costume and all! We had a 10:40 appointment for Alfie, made a few weeks prior. They do accept walk ups, but appointments are recommended. Once we checked in we waited on a comfy bench until a barber was available, at which point our name was called. We were placed with Diane who was an absolute dream. 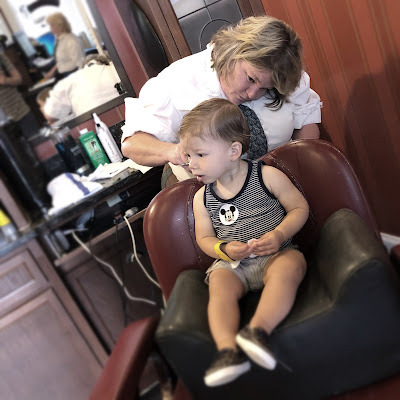 She clearly knew about parent anxiety when it comes to the first haircut, and made us very comfortable. She was also well versed in baby distraction. During our consultations, very nonchalantly, she pulled out half a dozen Mickey stickers and stuck them all over Alfie. This was enough to keep him busy for the five minutes his cut took. (I was very clear we just wanted his baby mullet cut off, since were growing the rest out...) She did a wonderful job, and I would be happy for her to cut his hair again. even the receipt is a souvenir! All of the food at this place was totally amazing. I had multiple servings of the delicious lamb entrée. The space at Seattle Wedding venues is absolutely incredible. The breathtaking views of the city are absolutely incomparable and all the guests were completely amazed. This is amazing. At some point, I'd love if you blogged or vlogged some tips for taking toddlers to Disney World. All of these other bloggers have me stressed by the idea but I'd love your tips! US Open Tennis 2018: The final Grand Slam of the 2018 tennis season is about to take place at USTA Billie Jean King National Tennis Center in New York City. Thank you for sharing this helpful post. Nice blog. I must say this is the wonderful blog on Shop Signs. Thank you so much for you amazing blog. Keep updating this. Immediately drawn by writer’s exclusive way of writing. يعتبر الحمام من الطيور الأليفة التي لا تحمل الكثير من الأضرار والمخاطر التي تهدد حياة الفرد، لكن كونها تظل طليقة العنان لا ضامن لها من دخولها المنازل مما يسبب الكثير من الفوضى والخسائر المادية التي تكلف الفرد الكثير من الأموال وتسبب الانزعاج للجميع، لدخولها بشكل مباشر للمنزل دون سابق إنذار، لذلك تهتم شركة طارد حمام بالإحساء أفضل الخدمات المتاحة بأفضل الإمكانيات المتوفرة التي تهتم بمكافحة الحمام وتهتم بتركيب عدد كافي من العوازل الذي يقوم بعزل المنطقة بكاملها حرصا على توفير أفضل سبل الراحة، والتغلب على الانزعاج الذي يسببه دخول مثل هذه الطيور كما توفر الشركة عدد مختلف من الطوارد التي تتناسب مع كافة الأسطح المراد عزلها.